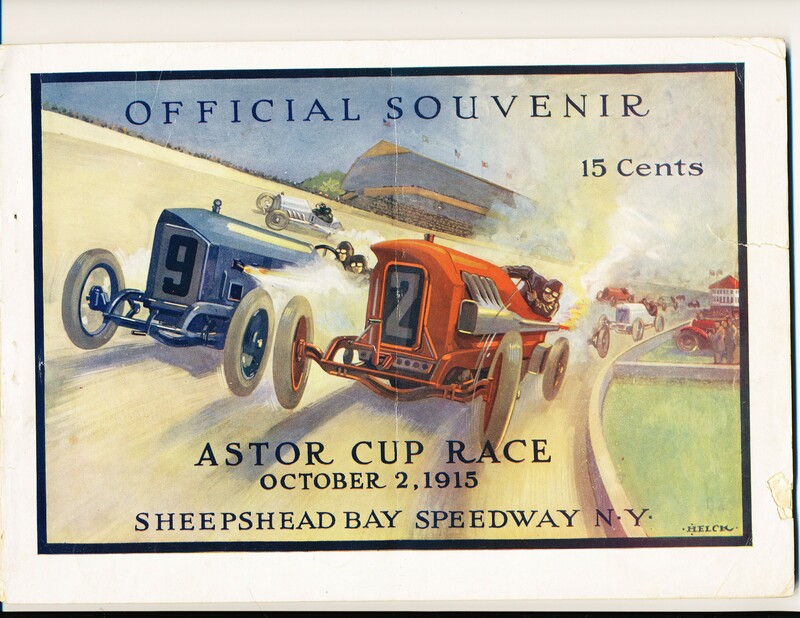 This is the cover to the Astor Cup souvenir program from October 2, 1915. The race was conducted on the Sheepshead Bay Speedway, one of the early board tracks that sprouted up in the late teens through the late 1920's. Indianapolis Motor Speedway founder Carl Fisher was the first president, but stayed only briefly, resigning almost immediately after launching the business. When October 2 arrived, the new track was soaked with rain. The maiden race was postponed and finally ran October 9. In the interim, tragedy struck as two-time Vanderbilt Cup champion Harry Grant was severely burned in a practice accident with his Maxwell and eventually died of his injuries. Stutz driver Gil Andersen won the 300-mile race, an event that was only repeated once more in 1916. A handful of other races were conducted at the track, but poor management drove it into receivership and it was dismantled in 1919. Note that this cover was the product of the greatest and most prolific artist of this genre of auto racing art: Peter Helck.